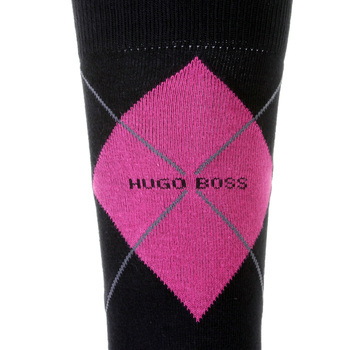 Hugo Boss Black label mens, soft cotton mix black with pink Argyle socks. Woven Hugo Boss logo on side. Finest combed cotton, comfort band for optimum hold, pressure free hand linked toe, extra reinforced high heel and stress zones. Cotton mix. SKU-BOSS2527 Made in Italy. PLEASE STATE SIZE REQUIRED WITH ORDER.